Pic(k) of the week 21: Free as a bird! Earlier this year, we both had a quick shot at paragliding during our "Empty quarter" adventure. Living in nature for a week, I will try to get some landscape photography in there as well. Being away from the net, it is likely that there will be not blogposts for just over a week. But no panic, I will be back! Beijing is a great place for photography at the worst of times! The last time I was there, end of April, the weather was miserable; overcast skies with light drizzle and lots of "smog". A good moment to shoot the Beijing Hutongs; narrow alleyways with traditional courtyard residences. Part of the fun wandering through these neighborhoods is getting lost. Believe me, you will get lost! Some kind of a GPS device, like an iPhone is not a bad idea! 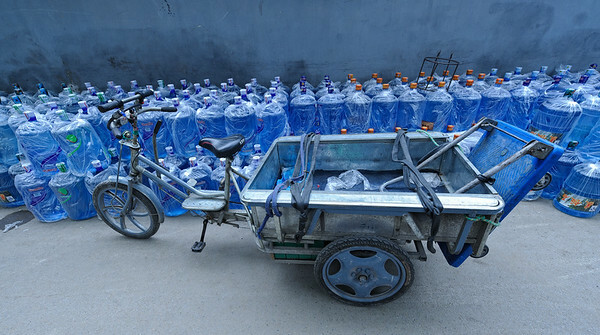 Just like any city in China, Beijing is full of bicycles and tricycles. The one above belongs to the waterman! Unfortunately the person in question refused to be in the picture. Next Monday, I'll be leaving on a 3 week trip to Europe; Southern Spain, The French Pyrenees and my home country Belgium... Plenty of opportunities for photography! Before going any further, Slidefest is a photography get together, where Dubai based photographers project a body of work on a large screen and take questions from the audience. One of the image makers was somebody I've been following for a couple of years; Catalin Marin, the guy behind the great photoblog Momentary Awe. We finally managed to meet and agreed to go out and shoot together in the near future! Anyway, early 2010 Catalin, made an amazing image called Burj after Burj A shot by dusk of the 2 best known landmarks of Dubai, Burj al Arab and Burj Khalifa. 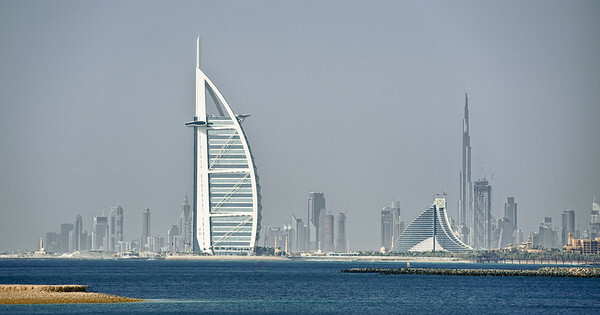 For the few people that don't know, Burj means Tower in Arabic. There are not that many places where one has a clear view on both towers together. By pure coincidence I bumped into the place where Catalin took his... at least I think so! Not wanting to copy each others work, I would to share my own "day" version of the image above. Even though I do prefer his version, I wanted to share the story! If you haven't done so, please make sure you check out Catalin's his blog at Momentary Awe! Last weekend was spent in the German capital of Bavaria, Munich. My camera bag for the trip was very light; one Nikon D7000 body and a single lens, the Nikkor 105 2.8 VR Micro, one of Nikon's best macro lenses. Probably worth mentioning is that Nikon brands all their Macro lenses as Micro's. Even though I do not call myself a macro photographer, I do enjoy having a close-up look at nature. The tulip season is slowly coming to an end, but still make for a nice painterly image. or a full selection of palms. For more of my Macro and Close-up photography work, click here. Pic(k) of the week 18: The Wild East! Just a two hour drive from Dubai, one finds the UAE "east coast", comprised of the Emirate of Fujeirah and parts of the Emirate of Sharjah. The "Wild East with its rugged coastlines at the foot of the Hajar mountains is the perfect place for a quick escape from busy Dubai. Exactly what we needed last week! By 4x4 one can bypass part of the highways and drive through one of the many Wadi's, Arabic for dry river. Small palm tree plantations and interesting small villages, make this for one of the most scenic drives in the UAE. Just after sunset I photographed some of the Indian Ocean rock formations on the beach close to our hotel, the Meridien Al Aqah beach resort. Wanting to smooth out the flowing water, it was a good opportunity to experiment with a recently purchased Fader Neutral density filter. This filters darkens the exposure by up to 8 stops allowing to shoot at much longer shutter speeds than one would normally need under given light conditions. 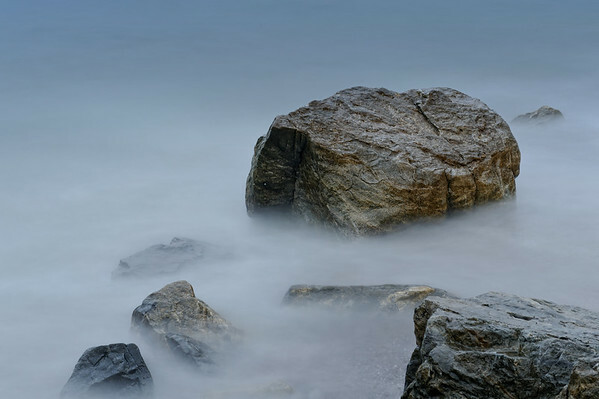 These longer exposures makes for a nice silky look of the waves hitting the rocks.